FINALLY it is ready for you to start knitting! After a long quest the Hunger Games cowl, now called Katniss Cowl is uploaded as a pdf download to ravelry because I realised it would be very very difficult to have it here nicely formated and everything and I guess you would like to print it easily too. Here you used find a photo tutorial on how to do the roped collar. This post has moved to my new blog here. This entry was posted in Knitting & Crocheting and tagged Cowl, Hunger games cowl quest, Katniss, Knitting, Tutorial by kathatravelling. Bookmark the permalink. Do you know if it’s possible in any way to have a french version ? Thank you and can’t wait to get started !! Hey, welcome to knitting. I could Guide you towards English-German lists but French, sorry, no idea. Just Google French – English Knitting and I’m sure you get dozens of list with translations! So do you have a german tutroial ? Do you mean the middle part? You pick up stitches along the front and back to form the collar. When I was watching the hungergames I was looking at Katniss’s cowl…your pattern looks really good! Je viens de m’inscrire sur le site…J’ai vu le film hier soir!!! je vais essayer de le tricoter pour ma fille…Avez vous rencontrer des difficultés? I’m confused. First it said to cast on 11 st, then 14. then row 2 is p3, k2,p1,k1,p4,k1,p2. Correct? So then row 3 is k1, p1, k1, ox, x, k1, p1, k1 p3. Am I reading it right? Thanks! 11 Stitches are for gauge and are one pattern repeat. To start you need 14 stitches. As for Row 1 and 2 yes you are reading it right. I’m trying to start this cowl for my daughter to knit. I’m having a mental block on the “slip one stitch purlwise then yarn over”. On the following row, when I drop the yarn over, I get a “bar” on the front side rather than just a loosened stitch as yours appears to be. I think I’m overthinking this. Help! No problem: you have to slip the stitch on the frontside with the yarn in the back, than yarn over, than slip the second stitch with yarn in the back as well. Like this if you drop the yarn over again, the “bar” is on the wrong side. Hi there. I’m almost finished knitting the front and back pieces and I was curious about your instruction to sew the pieces together. In the picture it doesn’t look like they’re attached to anything but the collar piece. Where exactly are they to be sewn together? Thanks. I’m confused by the way you wrote the gauge – I expected using one bulky and two sports would be fine with size 15 needles but mine definitely doesn’t come to a nice point in the triangle as yours does in the picture. I don’t see how this is possible with a cast on of 11 stitches – then when you move to the back row 1 has 14 stitches – not 11? I was also confused about binding off after 75 rows when only 73 rows are listed even though I know there is some variance for size . . .just keep going til the piece measures shoulder to shoulder. My problem could all come down to misunderstanding gauge – can you please clarify how many stitches to an inch your piece/pattern is? The Gauge is 11 stitches wide because this makes 4 inches, this would make about 3 stitches per inch. But to knit the piece you have to cast on 14 stitches. This probably clears up your misunderstanding. I’m confused about something. I see on the pattern that you’ve got two make 1’s which will give you two extra stitches for the next row. But you’ve also got a yarn over which creates an extra stitch, so I’m ending up with an extra stitch on each row. Am I doing something wrong? You must note that in the wrong side row, you don’t knit the yarn over, you just drop it again. 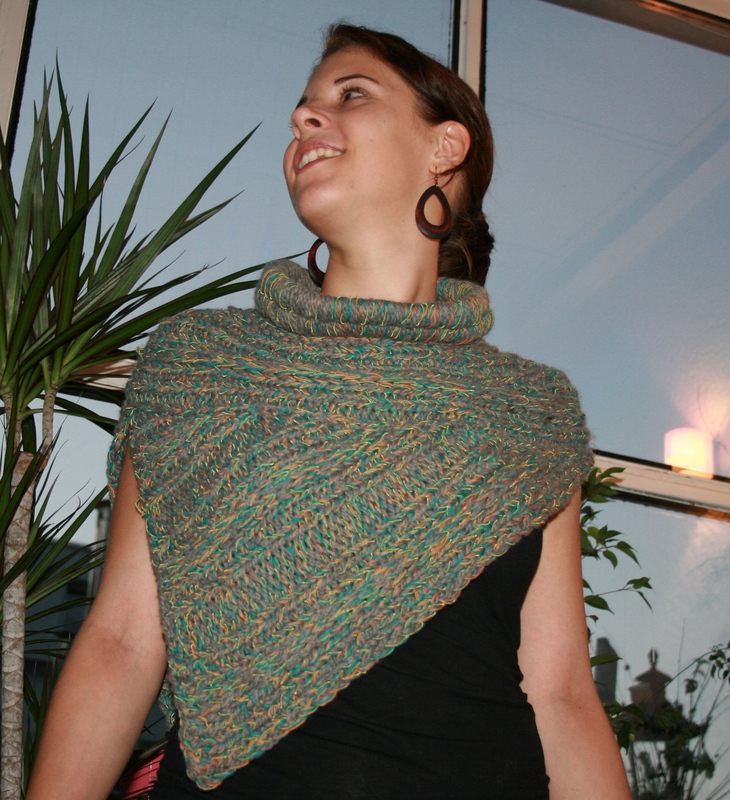 The yarn over therefore doesn’t give you an extra stitch, it just helps to loosen up the knitting. Ok. Thanks for clarifying that on the pattern. Just one more question. Are the make 1’s going to the right or left? In other words, are you picking the yarn up from the front or back? Back = Right. Front = Left. Hi, I like the pattern, but I’m having trouble following it. On row 1, I see K2,P,K, slip one purlwise then yarn over, slip one purlwise, k, p,k,p,p,k,k,k. on row 2, I see p3 (why, if the first three on row one are k2, then p)? Could you explain the first 2-3 rows? Thanks. Hey, thanks for your question. You should note this: row 1 is NOT knitted. It is your cast on row and just noted so you know where row 2 comes from. The first row you actually knit is row 2 (not noted in the chart as it is a wrong side row) and this is why it is p3, k2, p1, k1, p4, k1, p2. Hope this helps! Thanks for your help. I’ll give it a try. It’s a great looking project. Thank you for the pattern and all the work you did to put it together. I am in the process of knitting it. Did the front last night. What I plan to do is pick up the yoke stitches on either side and make like a criss-cross on the back instead of the second “triangle” piece (when I sew the double tube piece it will be wide enough to work). I can then take the other end and sew it to the side to close it off like in the picture she is walking into the victors village. I’ll let you know how it comes out. I used 1 strand of an “oatmeal speckled” yarn and 1 strand of the thicker Alpaca yarn in cream which gave a nice thick rustic texture without being too stiff. I’ll post pictures if you want when it is done… let me know where to post. The pattern is awesome…once I got the hang of the design it went really, really fast! Wow that sounds really cool. I would be super happy to see pictures of your cowl. Post them on ravelry and link them to the pattern if possible. This would be really nice. Don’t worry. It isn’t as complex as it seems and it knits up really fast due to the big needle size. I think the chart might look a bit scary but if you have managed to shape a heel for a sock than this is not that much more complicated. THANK YOU! I would be so excited to see you work on that and hope the pattern is good enough to guide you through! So far, so good. I am using us scrap yarn and may over-dye it when I done. I am kind of liking the post-apocalyptic look of all the different yarns, though. I liked that too. My first one is grey wit orange, light green and turquoise which from my perspective is a great colour combination and the second one I made is medium blue, light and dark greish blue, dark blue and white. It gives a great effect, I think.